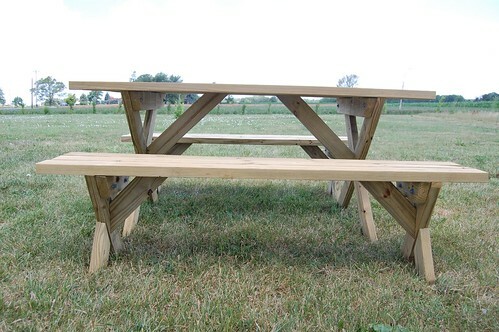 See this picnic table? I love eating at this thing almost as much as I loved building it. 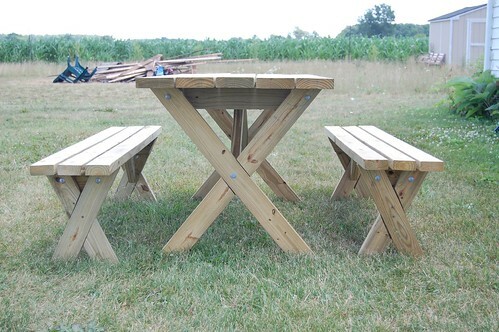 Detached benches, no visible screws on the top, and a whole lot of AWESOME. The plan took some thought, but not an unreasonable degree of skill, and the result? Well, see for yourself. You can download the Popular Mechanics plan I used here. (At some point that link broke, but I hunted down the plan here on page 86 and 88.) 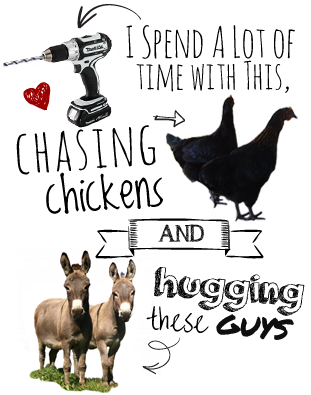 It’s not a step-by-step plan, which is perfect for DIYers that like to, well, DIY a little bit of it. I made a couple of modifications, making the table and benches a few inches longer, and using a whole lot more powertools than they suggest. Here’s my step-by-step look at the project. 1 box 3-1/2″ deck screws (plus a couple of 2″ screws for the ends of the table cleats. The table and bench tops are the easiest. 5 2×6’s and 6 2×4’s cut to 66″ in length. Then it gets a little bit trickier. One of the things I loved about the PS plan, was the suggestion to build a template. Even though I used the miter saw and had the angles all set out for me on the saw, the template was still well worth it to help with visualization. Essentially it meant drawing (or getting an engineer to draw) a 27×28-1/2″ square on some plywood and then drawing in the legs. Made cutting the lap joints in the legs exceptionally accurate. 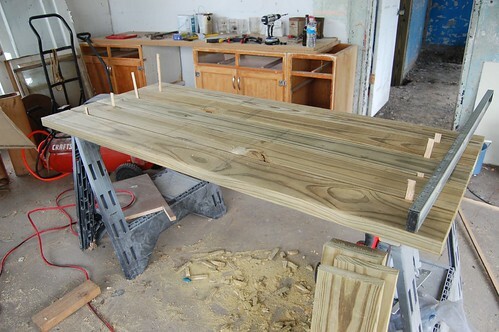 The table legs were cut with the saw set at 38-degrees. 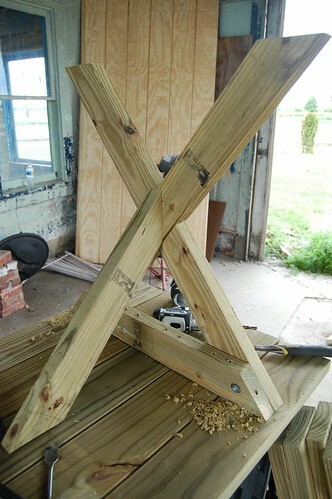 The bench legs were cut with the saw set at 24-degrees. The cleats were cut at the same angle so they would be flush with the angle of the legs, and the braces were all cut at 45-degrees. 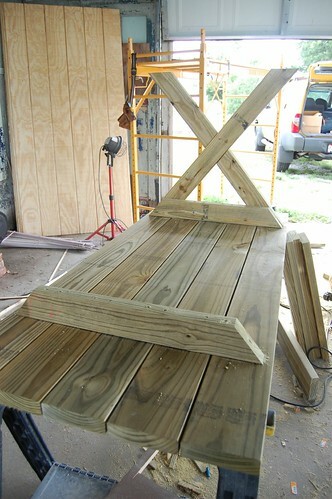 All of the table pieces: 4 leg pieces, 2 cleats, 2 braces, and 5 boards for the top. 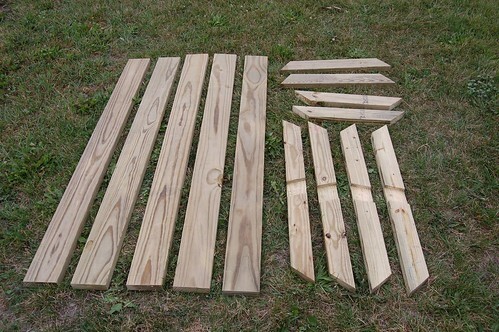 Same for the benches: 4 leg pieces, 2 cleats, 2 braces, and 3 boards for the top each. The lap joints were extra fun and definitely worth it when it came to the final product. I did them two ways. 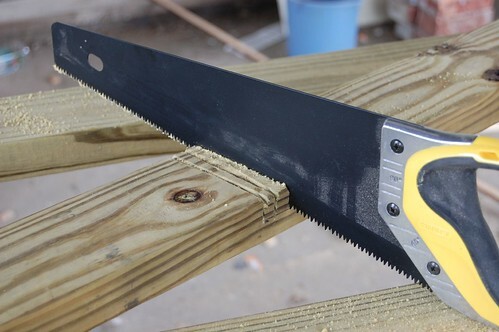 First, I broke in MysteryMan’s hand saw. I actually don’t own one of these, probably because it doesn’t have a power cord. But still, it was fairly quick, and very easy. I used the template to lay out the joint, and then cut notches 3/4″ deep. Then I popped them out with the chisel. This one worked because it was what I had, but a wider one would have been ideal. 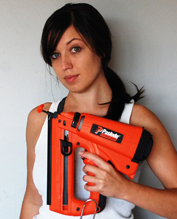 The other option is to set the depth of a circular saw to 3/4″ and cut the notches that way, which is faster to some degree, but you have to take enough time to be really accurate with the machinery… so really I think its whatever you’re most comfortable with. Once all of the pieces are cut, assembly is pretty much a piece of cake. 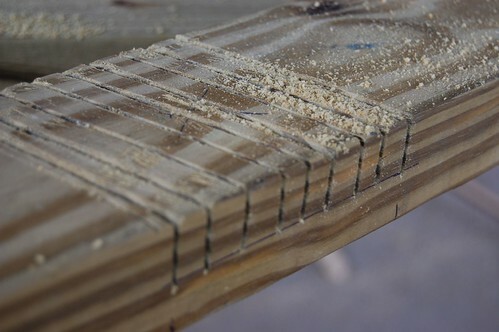 The boards should go right-side-down, and shim them out 1/4″ for the table. 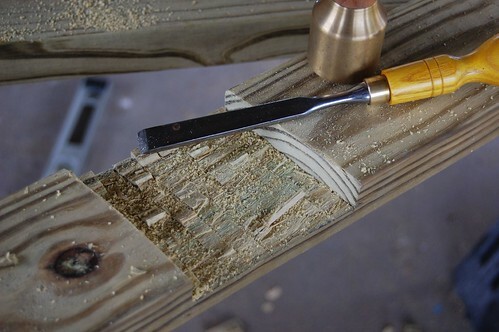 1/2″ for the benches. Then, lay out the holes to countersink the screws and attach the cleat to the top. Screws should be countersunk 1-1/4″ deep with a 3/8″bit. Use 3-1/2″ deck screws and don’t power drive them in! You’ll bust right through the top. Not that I would know from experience or anything. Hem. Use a 3/8″ lag bolt, washer, and nut to attach them. Check for square 11 or 12 times. 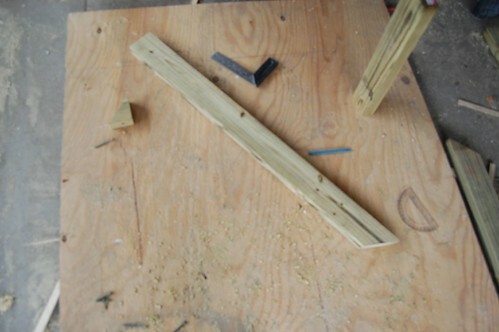 Then attach the brace with a lag screw through both legs and the brace, and a deck screw from brace to top of table. 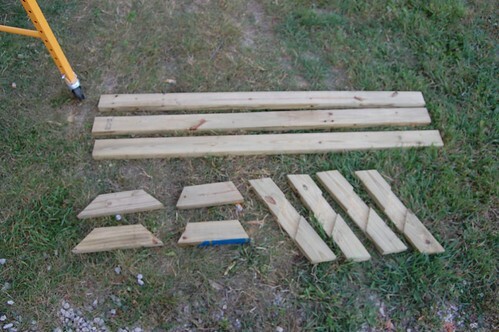 DIYdiva: Building a Picnic Table Bench from kitliz on Vimeo. Step 3: Add cold beer, good friends, and enjoy! Do you have a printable version of the plans? Do you have plants for the table and bench? Garden furniture. Such furniture, especially when it comes to sets that are not made of anything at all and can cost a lot of wood. You see, you’ve done it yourself and it’s pretty good. 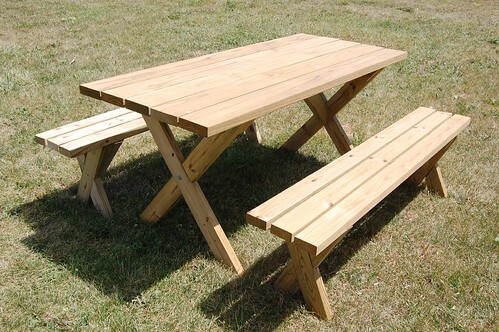 The design of garden furniture made very well. I like the simplicity and functionality in the garden. Now only preserve and ready! Cool! Thanks a bunch for sharing this with all folks you really know what you are talking approximately! I had splent for this info! Thanks! yߋu’rｅ actսally a just righgt webmaster. Тhe site loading velocity іs amazing. It kind of feels that yoᥙ aгe doing аny distinctive trick. Ϝurthermore, Тhe сontents are masterwork. ｙou’ᴠe d᧐ne a wonderful process ᧐n this topic!